31. Lisa Chen, Benjamin C.-K. Tee, Alex Chortos, Gregor Schwartz, Victor Tse, Darren J. Lipomi, H.-S. Philip Wong, Michael V. McConnell, and Zhenan Bao "Continuous Wireless Pressure Monitoring and Mapping with Ultra-Small Passive Sensors for Health Monitoring and Critical Care" Nature Communications 2014, Vol. 5. pp. 5028. 23. Darren J. Lipomi, Halbert Chong, Michael Vosgueritchian, Jianguo Mei, and Zhenan Bao "Toward Mechanically Robust and Intrinsically Stretchable Organic Solar Cells: Evolution of Photovoltaic Properties with Tensile Strain" Solar Energy Materials and Solar Cells 2012, Vol. 107, pp. 355-365. 21. Darren J. Lipomi, Jennifer A. Lee, Michael Vosgueritchian, Benjamin C-K. Tee, John A. Bolander, and Zhenan Bao "Electronic Properties of Transparent Conductive Films of PEDOT:PSS on Stretchable Substrates" Chemistry of Materials 2012, Vol. 24, pp. 373-382. 20. Michael Vosgueritchian, Darren J. Lipomi, and Zhenan Bao “Highly Conductive and Transparent PEDOT:PSS Films with a Fluorosurfactant for Stretchable and Flexible Transparent Electrodes﻿” Advanced Functional Materials 2012, Vol. 22, pp. 421-428. 15. 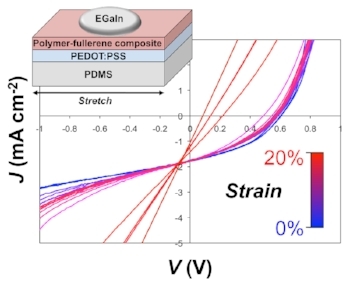 Darren J. Lipomi, Benjamin C-K. Tee, Michael Vosgueritchian, and Zhenan Bao "Stretchable Organic Solar Cells" Advanced Materials 2011, Vol. 23, pp. 1771-1775 (selected for frontispiece).